After the biggest drug bust of his career, veteran Detective, Malcolm Toohey (Joel Edgerton), enjoys a few drinks with friends before driving home. On the way, he barely clips a paperboy on his bike, but what should be a minor incident, becomes big trouble when the boy is badly hurt in the fall. Toohey calls the police, telling his fellow Detective, Carl Summer (Tom Wilkinson), that he was driving home and found the boy laying there. Summer believes him and lets Toohey on his way, but his young partner, Jim Melic (Jai Courtney), doesn't believe the story and despite his bosses orders, refuses to let it go. The story here is pretty solid, the investigation and police work that go into it are very interesting to watch. Unfortunately, the movie isn't focused on that, as its mostly about Malcolm Toohey and his conscience. We watch as the man turns into a shell of his former self, as he struggles with what to do next. This should be an interesting sub-plot, but not the whole premises of the movie, as it slows things down tremendously. This film moves at such a snails pace, that the terrific and unexpected ending, become almost farcical. Joel Egerton is really terrific in his role, showing how one split second can change a persons life forever. The whole cast was really good and it's a shame that such talent was wasted. 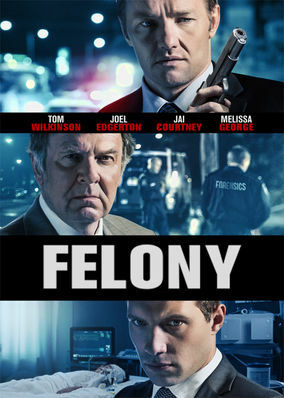 It's not that Felony is bad, it's just slow, and lacks the action a police drama should have. That being said, if you're into watching people battle their inner demons and fight their conscience, you might enjoy this film, but to me, it was somewhat boring.